Q: If you’re an STS scholar, how do you participate in a policy debate? A: (1) Identify some place where somebody can plausibly be accused of over-certainty and reductionism in their assertion of a solution to a policy problem. (2) Deploy your meta-knowledge of how controversies work to accuse participants in policy debates of over-certainty and reductionism. (3) Feel increasingly satisfied with your meta-knowledge that over-certainty and reductionism are the root causes of policy failure. If aversion to reductionism is indeed the central critical feature of Science and Technology Studies (STS, occasionally “Science, Technology, and Society”), the danger of reductionism is taken to be augmented by the prospect that science and technology carry a certain public authority that can potentially disguise this reductionism. This authority is thought to be based on the prospect that science and technology enjoy a certain separateness or distinction from the rest of culture and politics. The central authority-based failure to detect reductionism is taken to lead to follow-on varieties of failure, particularly: the structural failure of formal methodologies to cope with suitably complex and uncertain phenomena, the moral failure of methodologies to take into account divergent social and intellectual perspectives and values, and the failure of methodologies designed to resolve social problems and controversies to transcend controversy themselves. STS is often divided into two groups: theorists and activists. My sympathy tends to be with the theorists, simply because the theorists often seem as interested in studying instances of success as they are in failure. The point of STS theory seems to me to be to develop a vocabulary surrounding how epistemically and politically distinct groups arrive, or fail to arrive, at consensus, despite their disagreements about what knowledge is true, what the implications of knowledge are, or despite the incapacity of knowledge and technology to resolve underlying political conflicts. When 4S was in Washington last year, I attended, and also mistakenly signed up to be a 4S member (their website somehow led me to believe that registration + membership would be cheaper than registration as a non-member). Thus I started receiving Science, Technology and Human Values for a year. The last issue I received contained a tribute to Leigh Star, who passed away earlier this year, and they published a posthumous piece (paywall) reflecting on boundary studies in STS, in which she was a crucial player. Having recently posted on boundary studies in historiography (here and, after reading the article, here), I was interested to read Star’s take on it from a specifically anthropological perspective, and particularly the interest in developing a conceptual taxonomy of boundary objects, which could, in turn, aid anthropologists in making precise field observations. My sympathy here generally does not extend to participation, though, since I find this line of theorizing yields too little progress too slowly for my tastes, and also because, as a historian, the theory that is produced tends to be over-elaborate for my needs. On boundary objects, for example, if I find some object in history that has different meanings to different individuals, I typically do not need to assign it to a particular class of boundary objects, because it is enough simply to characterize what its varying meanings were, and what the implications were. This is not to say the object is not assignable, just that I do not really require the specialized vocabulary to proceed competently. The existence of a body of STS theory, however, provides a bedrock upon which both STS activism and historiography are thought to be built. The idea here is that the concepts provided by theory allows activists and historians to analyze, respectively, contemporary activities and the historical record, in more insightful ways than others can (whether due to their own self-interest, or their inheritance of critical and historiographical traditions that lacks the proper tools). For instance, those trained in STS methods might be thought more apt than others to recognize that objects hold differing meanings. Importantly, STS activists and historians need not use the theoretical vocabulary in its full depth (in historiography, specifically, I have never seen anything more than the most superficial applications of theory). Rather, it is enough that the theory provides the means to see what might otherwise be hidden behind authority specific to science and technology that others apparently accept and have historically accepted. STS may not be opposed to science, per se, but it is skeptical of it in that it takes science to be dangerously incomplete in a way that fails to acknowledge how the implications of scientific knowledge can be used by society, as well as the foundations of science’s own stability. Importantly, the existence of STS activism and STS-based historiography require others’ failure in order to attain their cogency. STS activism requires others to fail to come to the conclusions that STS scholars can. Or, at the very least, it requires the clarity of STS theory to bring coherence to others’ ad hoc and muddled efforts to attain stability. STS-based historiography requires a dual failure: it requires historical actors to be culturally prone to just the same kinds of reductionism-based failures that STS activism might allay (in this sense, it is an “inverted Whig” historiography), and it further requires that the historiography inherited from the past disguise or omit these same failures because they are contrary to historical (Whiggish and demarcationist) ideas about how science works and operates in society. The implication here is that if these were not the historical ideas at work, the failures would not have occurred (e.g. controversies about knowledge might have been averted or smoothed over). But the failures did occur, and it is left to the STS-informed historian to detect and recover antithetical visions of science from the historical record that allowed those failures to occur. E.g., to pick up on a recent post of Jai Virdi’s on articles by Paula Findlen and Simon Schaffer, to recover historical beliefs about the relationship of disembodied knowledge to the body and why this caused confusion and criticism surrounding various individuals’ claims and actions. However, there are tensions here that also need to be recognized. At the very least, there are severe problems of situating studies properly within broader contexts. STS and History of Science scholars have done much work assembling case studies to recover the deep connections between the culture of science and surrounding culture: such connections are taken to be surprising and interesting because of historical ideas supposing their distinction. However, in many ways the distinction is reinforced because the focus on the culture surrounding specifically scientific things does not really help us determine to what extent it did or did not matter that scientific matters were involved at all. 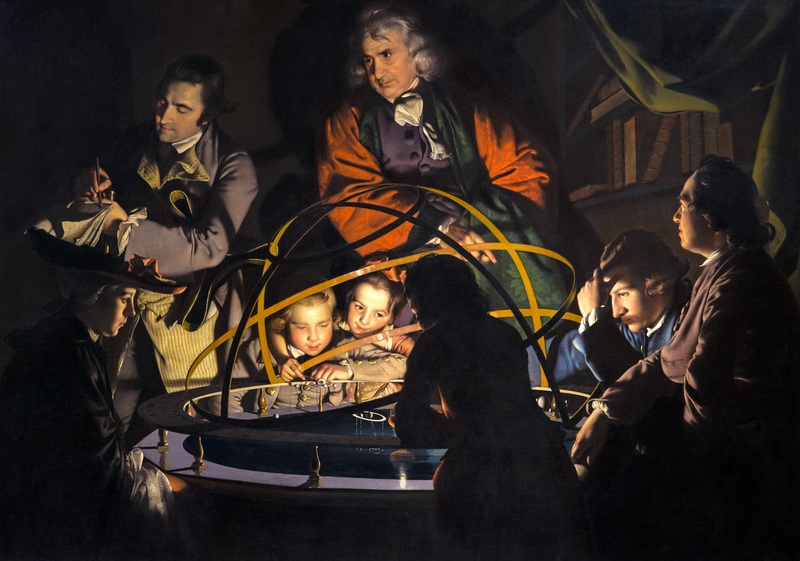 Joseph Wright, "A Philosopher Giving a Lecture on the Orrery in which a Lamp is Put in Place of the Sun" -- but would it matter what the central object of the painting is, so long as it conveys awe and novelty? If, for example, scientific objects — say, 18th-century orreries — doubled as theatrical objects, or collectors’ objects, and if we study how these objects were used as such, to what extent are we simply studying the the culture of theatrical or collectors’ objects? Outside of the fact that some astronomers may have objected to the use of these objects in ways that did not jibe with their beliefs about how they should be used, what can a historian of science add to an understanding of their use in these contexts? The absent understanding of context here would be whether or not an orrery used as a theatrical display is, in fact, typical of all theatrical displays, or whether it was special (say, it held some kind of special authority) because it doubled as a scientific object. Or, looking at Jai’s post, to what extent in studying the gender politics of Laura Bassi are we simply studying the gender culture of the rare women who were important in masculine spheres, philosopher or not? Or, is historical insultography really a hidden basis of epistemic success, or is it simply a useful annotation to prior historical portraiture? More seriously, there is also the potential for actually writing certain kinds of ideas out of history. If STS has it that the failure to understand theories articulated by STS scholars is responsible for historical failures to allay controversy, or to avoid unjust uses of technologies, to what extent does the history of science become the history of these failures? Was it possible for historical actors to succeed intelligently in ways only deemed possible through an enlightened access to later STS thinking? STS-informed historiography is good at chronicling the uses of the authority of science and resistance to this authority, but to what extent can it capture traditions of scientific deference to public opinion in political issues, or traditions of the public not deeming scientific figures to be a source of authority relevant to their main concerns at all? Likewise, if STS-informed historiography is good at identifying historical reductionism, to what extent can it identify traditions in the intellectual and institutional limitation of the validity of scientific claims, or traditions in the historical uses of accusations of reductionism as a polemical tool? More broadly, to what extent does the professional mythology of STS interfere with the historiography of science? Conflicts of interest need not imply a need for quarantine. Rather, recognition of potential conflicts of interest allows those conflicts to be managed intelligently and constructively. If historians of science were willing to push beyond the conceptual framework of STS to expand our knowledge of the richness of historical ideas, the historical record might begin to become much more coherent and satisfying. Likewise, if historians were more willing to move beyond the use of STS concepts in analyzing the historical record, and willing to challenge the mythology that adds to the appearance of originality in STS thought, STS theorists might be pushed to better systematize and articulate historical ideas in building their conceptual framework, rather than rely upon the weaknesses sometimes exhibited in others’ frameworks to retain confidence in the importance of their ideas. Once both historical understanding and epistemic-institutional theory are better bolstered, historians and STS scholars might finally find themselves in a far more advantageous position in entering the realm of public ideas, not as a revolutionary force, but as groups that acknowledge the full richness of ideas underlying existing best practices. Thanks for this. I’ll be rereading it for a while. FWIW, I don’t think the satire is that far off the mark, if more than a handful of STS-savvy scholars ever participated in policy debates outside of academia. This may not be fair to you, but if you have considered the potential for conflicts between STS and the fields it interacts with aside from history (usually philosophy, sociology, and anthropology), I’d be interested in your thoughts on whether the conflicts you described are unique to history and historiography, or how those conflicts might compare to those connected with other disciplines. You raise a fair number of questions about the potential of STS to answer certain kinds of questions. I’m sympathetic to the idea that STS tends to stick to certain critiques in its analyses, but I don’t know to what extent that’s an extension of problems with underlying theoretical concepts or a lack of willingness on the part of STS scholars. What are your thoughts on that? Thanks for waiting so long for me to follow up on my initial suggestion. The short version of this post is that a main tenet of STS is that there is no practical division between science/technology and society/politics. Yet, STS makes sci-tech the key focus of its attention. While there are those who suggest the need to obtain a new name for the discipline, typically the implication is simply that others take sci-tech to be special, thus establishing the need for a special study of them. While I am most concerned with the implications of this set of ideas in the analysis of history, similar implications would follow for the sociology and anthropology of sci-tech’s assumptions about contemporary popular, political, and scientific thought. I can’t speak from a broad familiarity with these literatures, but the glimpses I’ve seen tend to support this idea. If we were to remove the assumptions about others’ thought, I think it opens up whole sets of inquiries about how legitimacy can be claimed. If scientists seek to speak authoritatively, but also practice reticence, what rules govern how these practices are balanced in particular cases? This requires an interest in institution-building. Some strands of STS seem to be moving in this direction. When I was checking Penn’s Logan Lounge blog for the Toronto Blog Collective post, I saw that the last substantive post (June 1, 2006) was a discussion with Thomas Gieryn about the “neo-institutionalist turn in the sociology of science”. Likewise, the Studies of Expertise and Experience project at Cardiff investigates how people identify and call upon expertise in strategic ways. Interestingly, there is some uneasiness in STS with any turn toward an institutionalist study. There seems to be some concern that it turns attention away from the dangers that STS purports to identify. I would also suggest that such an emphasis brings it back toward the sociology of professions, from which STS parted ways some time ago. I would have to think studies in this vein tend to resemble more standard forms of policy analysis. Would this sort of thing leave a place for STS? I think it would, but it would have to take the problem of how its own ideas relates to others’ ideas in more than just an antagonistic fashion. This would diminish the professional self-image of STS, which may suggest a lack of willingness to extend and reconcile its theoretical concepts with others’. Ultimately, I think this would lift STS to a more relevant role, but it is also possible that some STS scholars would view heightened relevance as evidence of its retreat from the meta-analytical concerns that bring the criteria that establish relevance into question. This is helpful, thanks. As a policy analyst who should really try and finish his STS Ph.D. (ABD), your discussion of institutionalist studies and STS mirrors some of my frustrations at what I find as generally unsatisfying interactions between STS and policy (in both directions), whether we’re talking about the practice of policy or policy research. There are certainly other areas where the stances STS scholars tend to take (in terms of theory and jargon) make it harder for them to effectively engage with – oddly enough – the realities of practice. I guess I shouldn’t be that surprised that other stances make it a challenge for the field to engage effectively with its ancestral disciplines. Ha! As someone who’s first degree was a mix of HoS and STS and has done ‘practical’ work in terms of sci in society too, I recognise a fair number of those “tensions” (from all sides). Re policy involvement… well, there’s the interesting example of Brian Wynne leaving the FSA a few months ago. But I’d say that just underlines the way in which STS scholars, in the UK at least, are involved in sci policy (though rarely obviously – they tend not to talk about it on tv, etc). Again, we could query their influence, but it does happen. I’d also add that as I’ve been surprised in the last year or so to see how many professional sci policy people have some STS and/ or HPS training. I’ve also noticed that many of the key policy-influencing scientists have a keen interest in STS and/ or HPS ideas. I don’t know if you read Richard Jones’ blog, for example? Plus *waves* – I’m a fellow Imperial College blogger. Just stumbled across this blog. Hi Alice, I’ve just recently seen your contributions to some other blogs myself. I’m glad you found your way over here. Hopefully we’ll run into each other at Imperial soon. I did not know about Brian Wynne’s work with FSA (for those interested, there’s a Guardian article about it here). Being a fresh arrival to this country, I’d be interested to find out more about the UK STS scene, and the channels of its involvement. More than the STS influence, I’d be interested in how STS is identified as a possible contributor by others, and how STSers use their background once in these policy forums. Wynne, of course, is probably more committed than anyone in STS (save, maybe, Steve Fuller, in his particular way?) to being an activist for the inclusion of public ideas in science-related work, but I’d be curious if others bring such a strong perspective particular to STS to the table. The question occurs to me, because when I’ve seen good STS presentations, I’ve tended to think, “That was good policy analysis”, that is, it tends to blend in with the kind of work that comes out of policy schools and think tanks without any particular connection to STS, proper. Thanks very much for bringing this up. (Times, so a paywall – not worth paying just for that, but if you’re around a computer that subscribes, have a look as an example). Yes, Steve Fuller… Andy Stirling at SPRU too worth a mention though.